This Review of Cathay Pacific First Class 777-300ER NYC to Vancouver is Greg's account, on a recent business trip to the West Coast. You can also see my Cathay Pacific First Class Review Hong Kong to LAX and my Cathay Pacific The Wing First Class Lounge HKG Review. Here's my Cathay Pacific First Class Video; Subscribe to TravelSort's YouTube Channel to be alerted to future first class and business class airline videos and luxury hotel reviews. I recently flew Cathay First Class from JFK in New York to Vancouver. My sojourn from Manhattan to JFK had been terrible. The Airtrain from had been broken down leaving us suspended between terminals for about twenty minutes. And the lines to pass through airport security had been stalled for half an hour, due to some combination of a wheelchair, inept personnel and inept passengers. Luckily I had TSA pre-check and sailed through security in less than a minute. So I was especially happy to enjoy this luxury booking. The flight from New York JFK to Vancouver YVR is short: only 5.5 hours. Cathay Pacific's First Class cabin is one of the smallest, with just 6 seats in 2 rows, in a 1-1-1 configuration. I was greeted by name, and shown to seat 1A, on the left hand side. My wife had chosen my seat for me, and had selected 1A on purpose, since only seats 1A and 2A are accessed on this aisle, making them more private, with less foot traffic. In fact, there was no one in seat 2A, and only 2 other passengers in the rest of the first class cabin, making it an even more private experience. Cathay Pacific's first class open suites are very large and lovely. These are not closed suites such as Singapore Suites, Emirates First Class or Etihad First Apartment, but the width of the seats and overall experience makes Cathay Pacific still one of my favorite first class products. The leg room is tremendous, and the seat is large, extremely wide, and perfectly comfortable. The seat controls were very intuitive and simple. Even on my flight of under six hours, the large compartment and very comfortable seat were a treasured luxury after a hectic trip to the airport. After boarding, I was offered an Aesop amenity kit and a grey cotton bag with blue Pye organic cotton pajamas, and matching blue slippers, both in large, which fit my 6'5″ frame. If they fit you, these super soft pajamas are worth keeping, given the quality and that they're made of organic cotton. After take-off I was also brought a dish of warm, smokily delicious nuts, and also decided to have a cheese plate, which was fine, but nothing special. The Cathay Pacific service was wonderful, extremely helpful in making such a short flight a delightful experience. The attendant quickly changed my seat to the flatbed, and back, upon request. And the attendant even allayed one of my pet peeves on first class flights: the attendant noted when I had finished with one bottle of water. Overall, the service was fantastic. weather had frozen everything at JFK and so there was a significant delay while the plane was being deiced. I chose to watch the remake of the Stephen King film “It”. The film was just the right amount of scary without being too gory, and was highly entertaining. Overall, the English-language film selection was very good. comfortable hours were much appreciated. from New York to Vancouver, I found myself enjoying every aspect of this luxurious product. If you've flown Cathay Pacific First Class, what was your experience? 4 Comments on "Review: Cathay Pacific First Class 777-300ER JFK-YVR"
I love Cathay’s 1st Class. Have flown it several times between HKG and Europe, and look forward to flying it in December HKG-JFK and then JFK -YVR. It’s usually a very solid product, even though the bed and food are not my favorite, and the fact there are just 6 seats in the cabin, which often isn’t full, makes more for an especially nice experience. Hope you enjoy your upcoming flights. 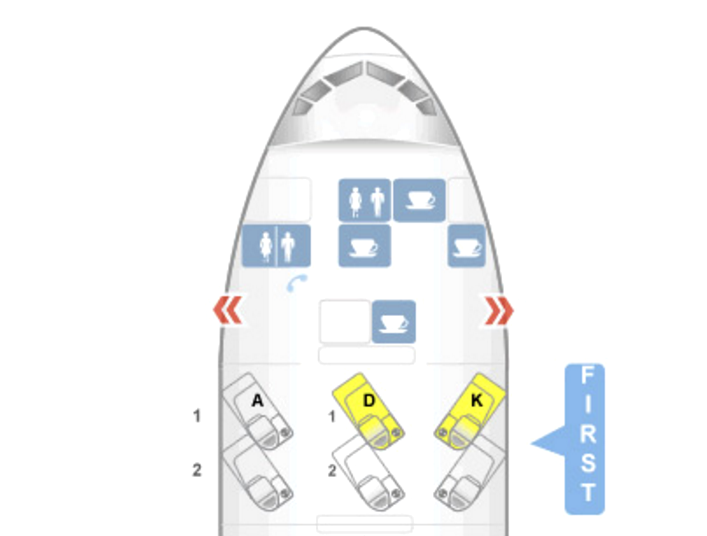 Which seat do you think is better, 1A or 2A? Many will say 2A, but because it’s a bassinet seat and you run the risk of being displaced I prefer to book clients in 1A, even though the risk is small of the bassinet being needed. I prefer both of these seats to the others, since 1D, 2D, 1K and 2K all access the same aisle.